The following is the definitive collection of resources for one of my sessions at the New Jersey Music Educators State Conference and the the Technology Institute for Music Educator’s National Conference held in February of 2010. 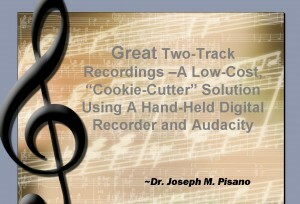 The session was titled: “Great Two-Track Recordings -A Low-Cost, “Cookie-Cutter” Solution Using A Hand-Held Digital Recorder and Audacity”. This session details the process of mastering directly from a Two-Track recorder and getting great results in a straight-forward way. The basic two requirements to implement this are a high-quality stereo recorder like the Zoom H4n (the article that I referenced in the podcast/session can be found here) and digital editing software like the open-source product Audacity. Re-live this session (or experience it for the first time) by taking advantage of the resources listed here. All of these materials are provided for students and educators under a 3.0 Creative Commons License. I hope you enjoy (or enjoyed) these materials. Please check my upcoming events, presentations, and concerts for future opportunities to visit with me. Additionally, you can find the “pulse” or “Back-Channel” of the TI:ME 2010 conference (including Live Tweets During my session) by visting the Complete #TIME10 Twitter and Timeline that I created. The commentary and resources provided through these Tweets are a goldmine!